My pal Nigel is always quick to pick up on ideas with good fishing potential. Also, he's much better at DIY than I am so he's very likely to improve on any repairs and alterations that I make. Anyway, he soon realised the possibilities of Texas rigged lures for snaggy, weedy conditions and when we went out the other morning he'd already produced one of his own. It consisted of the front of a dark coloured Slug-Go with the tail of a bright yellow jelly worm. I was still using my own hybrid which had already caught several decent bass over the past week. We started fishing at dawn. In fact Nigel was down on the shore before me and he'd already freelined a mackerel head for half-an-hour when I arrived. It was very calm and the water was, in most places, gin clear but the fish seemed to be elsewhere. As time went on we walked along the shore trying a number of likely spots. Nigel switched from his bait to the new soft plastic but still there was nothing doing. After about an hour I came to a corner where the weed was piled high at the waters edge. The rotting vegetation was colouring the sea with a dark, peaty stain and there were lots of weed fragments in the water. I flicked out the lure into the coloured water and began the snails pace retrieve. Suddenly there was a sharp yank on the line and I raised the rod but made no contact. Bugger! Nigel joined me but five more minutes of joint flogging produced no more bites so we moved on. After another fruitless hour of cast and retrieve we'd both just about had enough so we began to wander back, stopping occasionally for a chuck into a likely spot. Now we were back at the weedy, peaty place. The tide was a bit further in and it looked really good so we both began to fish. Suddenly Nigel called out and I looked up to see him playing a fish. The bass fought pretty hard and it was some little time before he managed to beach and release it. A good start for his 'New', lure. We fished on for a little longer but clearly that was to be it for the morning so we went home As we parted we arranged to meet in the evening for a high water session. 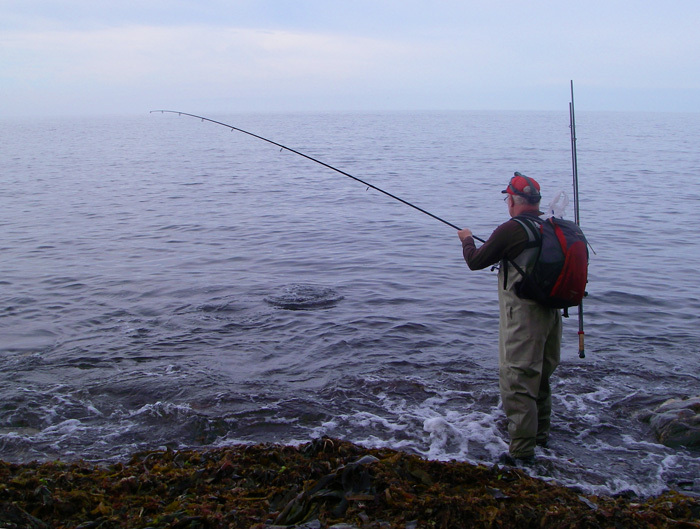 After tea I drove down to the coast, this time armed with both the spinning rod and the fly rod - in case of mullet. What a change! The wind had increased to force 6 and the sea was rough and murky. When we arrived at our chosen spot the weed was already washing into the sea and shoals of mullet were grazing at the water surface. It was clear that fly fishing was a non-starter. 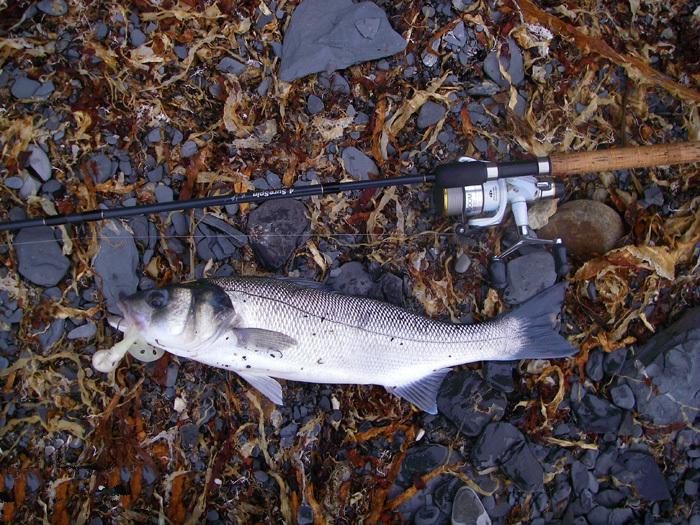 The onshore wind, heavy surf and tonnes of drifting weed would make it really difficult to fish and virtually impossible to land a hooked mullet. Frustrating! I'll say! 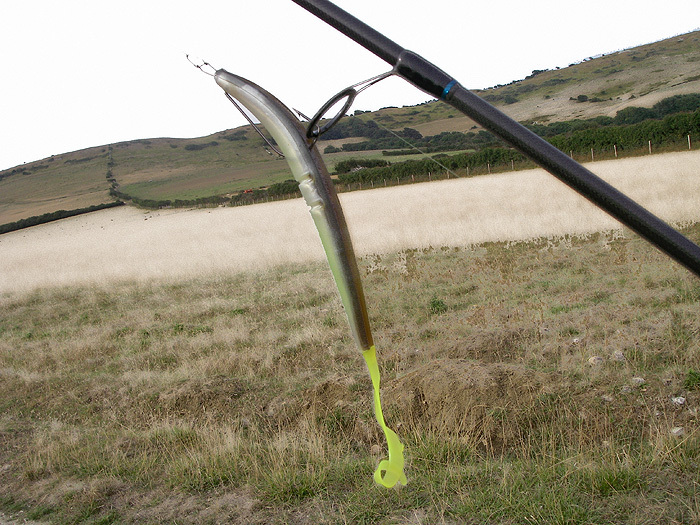 Anyway, it was ideal conditions to test the weedless soft plastics so we picked up the spinning rods and began to cast. Although there were loads of mullet cruising about only a few metres from the edge the bass seemed to be thin on the ground and for half-an-hour or more we had no sign of life. On the credit side the lures performed perfectly and despite the conditions we scarcely had to clean any weed off the lines at all - wonderful! Cast, cast and cast again. 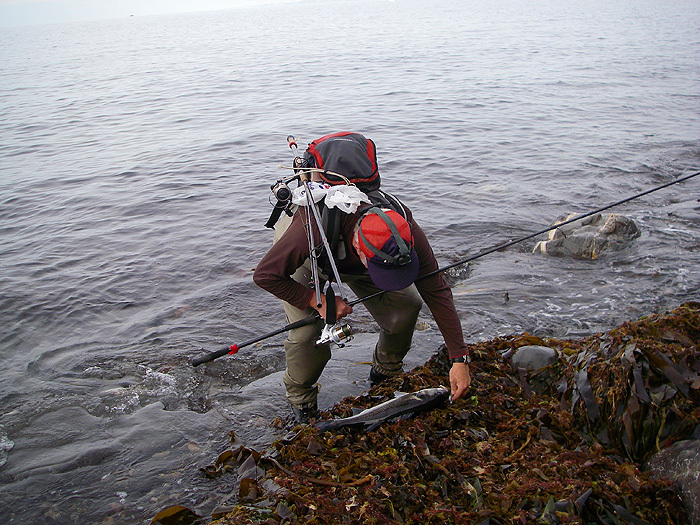 The straps of kelp wrapped around our booted feet and the undertow threatened to dump us in the water. The air was full of seaweed flies and every so often one would make its way into your mouth. Ugh! On my umpteenth cast the rod was dragged over as a fish siezed the lure. Magic! I played it carefully and using the waves managed, after a while, to slide it ashore. I took a couple of pictures before taking out the hook and sliding the bass back into the waves. By now Nigel had joined me and it was not long before he was also into a sizeable bass - the second one on his newly made weedless lure. Nice fish! The tide had turned now and that was the sum total of our success for the evening. One fish each was very satisfying. On the way back we both got thoroughly soaked by the waves beating against the cliff but we didn't care.